Performance Time: Approximately 75-90 minutes, 62 pgs. MUSICAL. Ma is sick of making stew out of old shoes, wash rags, and garden gloves, but Jack won’t sell the family’s cow, Bossy. Fed up, Ma and Pa send Jack to the fair to sell Bossy so the family can eat a decent meal for once. When Jack meets up with a butcher, a glue maker, and a leather salesman at the fair, he can’t bring himself to sell poor Bossy. 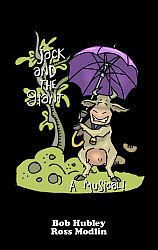 But then Jack encounters a peddler who promises to launch Bossy’s career in show business as a singing, dancing show cow. Jack believes in Bossy’s talent and trades her for some magic beans and 10 percent of Bossy’s show biz earnings. Angry that Jack brought back beans instead of money, Ma throws the beans out the window, where a giant beanstalk grows. The next day, Jack and his pet cat and dog climb the beanstalk and reach the city of Cloud People. The friendly Cloud People take Jack to the Giant’s castle, where he meets a magic harp that can sing, a hen that lays golden eggs, a clock that talks, and a pair of shoes that dance. Jack even encounters the Giant, whose reputation proves taller than his stature! Your audience will love this play’s lively, original songs.